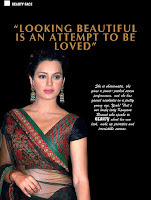 Kangna Ranaut is an Indian actress who acts in Bollywood films. She made her Bollywood debut in 2006 in Gangster. She won both a Filmfare and a National Film Award for Best Supporting Actress for her performance as a troubled model in Fashion (2008). Now Kangna Ranaut on the cover of Beauty Magazine for ....the month of July 2010. Kangna Ranaut will seen in her upcoming movie Once Upon a Time in Mumbaai in which she will share the screen with Ajay Devgan, Emraan Hashmi, Prachi Desai, Randeep Hooda.